ELIZABETHTON, TN (WJHL) — Some students at an area school were exposed to bed bugs Friday, according to an Elizabethton City School official. According to Director of Elizabethton City Schools Dr. Corey Gardenhour, a bed bug was found on a bed sheet this morning on an overnight camping trip for fifth grade students of Harold McCormick Elementary School. The bed bug was in a girls dormitory that housed around 30 students. The discoveries did not stop there. Gardenhour told News Channel 11 when students returned to school today, a bed bug sniffing dog searched student luggage, finding the bugs in a few students’ bags. 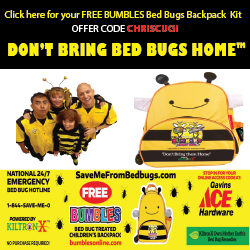 Gardenhour said a bed bug was also found on a school bus. Administrators said they bagged up the items in which bed bugs were found and sent parents home a note with a protocol on what to do at home to treat clothing. Gardenhour said right now the school system is unsure how many students were impacted or where the bed bug problem originated. He said the bus and the school have both been cleared for bed bugs. The incident did not impact school hours.